Sit back, relax and take in the view inside one of Denver&apos;s most iconic historic landmarks, Denver Union Station. Located in the heart of downtown Denver, the renovated 1914 Beaux-Arts train station is home to 10 chef-owned restaurants and bars, boutique shops and the 112-room Crawford Hotel. 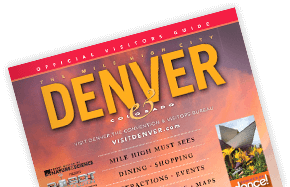 Union Station is also the transportation hub for The Mile High City, offering access to RTD&apos;s front-range bus route, the free 16th Street Mall shuttle, the free Downtown Denver Circulator, the FasTracks light rail line and Amtrak trains. There&apos;s a new rail service between Union Station and Denver International Airport (DEN) with six stops in between. It takes about 37 minutes to get from the airport to Downtown at a cost of $10.50 each way (with discounts available). Pick up maps, Official Visitors Guides, rail service info and arrival guides (with hotel information); also receive personal assistance. The Crawford Hotel offers tours of Union Station on Fridays, Saturdays and Sundays at 1 p.m. and most other days at 4 p.m. Tours are $20 per person and a portion of the proceeds benefit The Crawford’s Dollars For Dreams non-profit partners. Tours last one hour and showcase Union Station’s history, art, transportation, restaurants, retail space, and The Crawford Hotel’s luxury guest rooms. Each tour is followed by a complimentary Union Station Kolsch, house red or white wine, or non-alcoholic beverage at the Terminal Bar. With its urban locale, Union Station might seem like an unlikely spot to find fresh, local produce, but you can do just that every Saturday from June 4 to October 22, 2016. Between 9 a.m. and 2 p.m., farmers and food producers set up shop on Denver Union Station Plaza for the new Union Station Farmers&apos; Market, offering Denverites access to the freshest local fare, from fruits and veggies to cheese and fresh-baked bread. Union Station is also the site of Denver&apos;s latest urban beekeeping program, with four hives located on the roof of the building. The station and its restaurants partnered on the project, meaning that at some point, patrons may be able to order pastries, drinks and other treats made with honey produced on-site. The use of recycled materials, increased ventilation, natural light, and a green cleaning policy helped earn Union Station&apos;s Bus Concourse a Gold LEED certification for green building. It is only the ninth transit building in the country to earn LEED designation. LEED, which stands for Leadership in Energy and Environmental Design, is a green building certification program that recognizes best-in-class building strategies and practices. For more information about Denver Union Station and its colorful history, visit unionstationindenver.com.